Le Creuset and Fire Wire Giveaway! 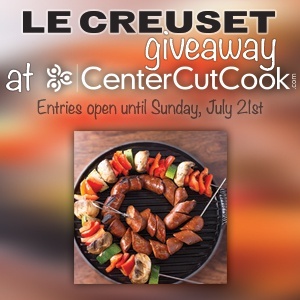 Enter to win a Le Creuset Bistro Grill + Fire Wire flexible grilling skewers! Two runner-ups will recieve a set of Fire Wire too! 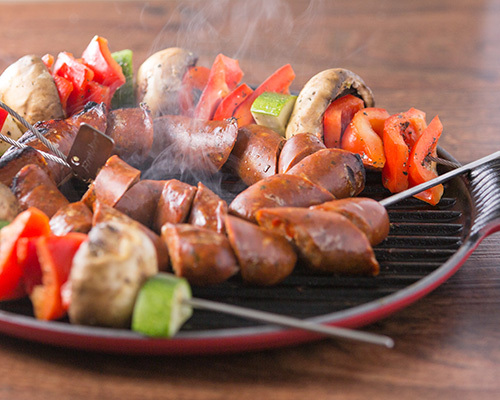 Summertime grilling is a favorite pastime ’round these parts, whether it’s Grilled Chicken Sausage Kabobs, Grilled Pineapple, or Sizzling Chicken Fajitas! Some days the weather is perfectly suited for getting the charcoal lighted, other days when it’s raining and storming or during the winter months when its below zero and snowing?… well not so much! For those times I rely on a grill pan. Recently Le Creuset provided me with their cast iron Bistro Grill Pan to try. Not only is it beautiful in cherry red, it cooks like a dream! You may have spotted me using it for my Grilled Shrimp Bruschetta. And more recently, I used it for my Grilled Chicken Sausage Kabobs. 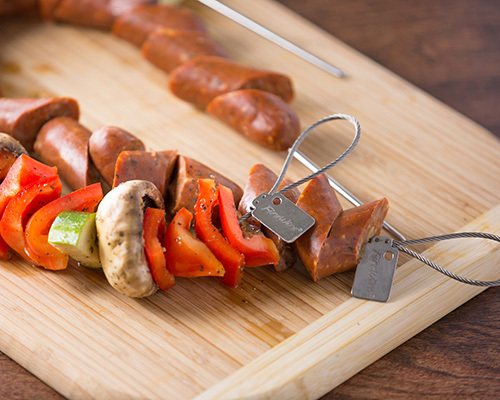 Speaking of Kabobs, have you heard of Fire Wire grilling skewers? 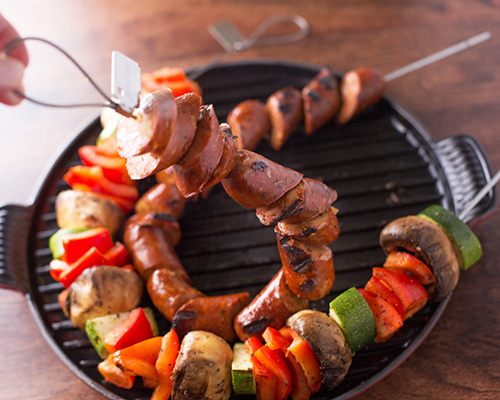 They are flexible, all stainless steel skewers that take the pain out of cooking kabobs! You can fit SO much food on each skewer and my favorite part? They stay cool so that you can easily rotate the food that you’re cooking, or remove them from the grill. I was given a set of these to try too, and they are awesome! Now for the fun part: One lucky winner will receive a Le Creuset Bistro Grill Pan PLUS a set of Fire Wire grilling skewers! AND THEN… two additional winners will each receive a set of Fire Wire. Yay for giveaways! To enter, just use the Rafflecopter widget below. To enter, all you need to do is leave a comment below telling me what your favorite thing to grill is. There are plenty of other ways to earn additional entries including following @CenterCutCook, @FireWireGrillin and @LeCreuset on Twitter!